Jams and jellies need a substance called pectin in order to gel. Some fruits are naturally high in pectin, but others are lacking. Adding commercial liquid or powdered pectin is one way to get a low-pectin fruit jelly to gel. But you can save money by making an equivalent product from apples. 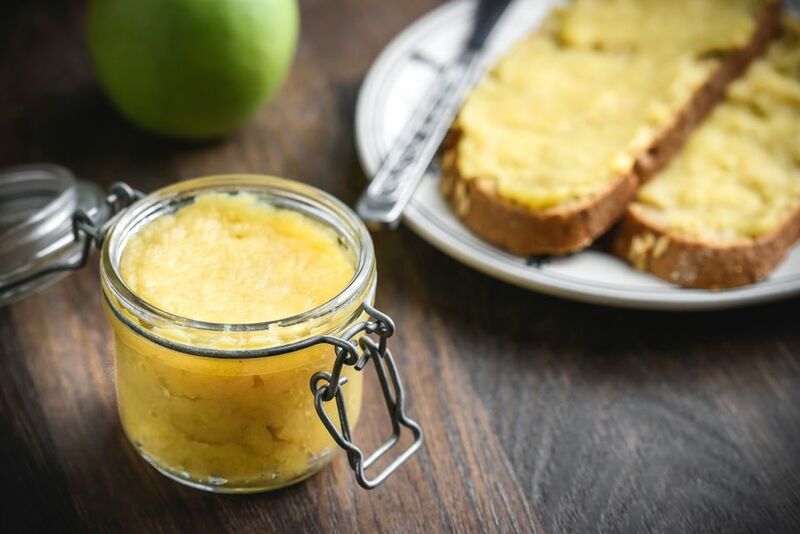 Homemade liquid pectin can be made from apple scraps, meaning the cores and peels. Just stockpile these in the freezer until you have enough for the recipe. Be sure to use organically grown fruit if you are using the peels. Keep in mind that tart, under-ripe apples contain more pectin than sweet, ripe ones. Place the apples in a large pot. Add enough water to not quite cover the apples. Bring to a boil. Reduce heat and simmer, stirring occasionally, until the apples are getting mushy, This can take as long as an hour. Strain overnight through a jelly bag or through a colander lined with several layers of cheesecloth. Compost the pulp left in the bag or colander. The slightly thick liquid that strained through is your apple pectin. Use in your homemade jelly or jam. Use your homemade pectin to make jelly with low pectin fruit. Combining equal parts low pectin fruit juice and an equal amount of homemade pectin. Measure the combined liquid, and then follow a jelly recipe for how much sugar and acid (usually lemon juice) to add. Use about 1/4 cup apple pectin per cup of fruit for jams. For jellies, use 1/4 cup apple pectin per cup of fruit juice. Measure the combined pectin and juice and add an equal amount of sugar. For future use, you can either freeze it or can it. To can it, heat the strained pectin just to a boil. Pour into clean pint canning jars, leaving 1/2-inch of head space. Secure the lids, and process in a boiling water bath for 10 minutes (adjust the canning time if you live at a high altitude).